It's Marco's Pizza night! By ordering online at www.marcos.com and choosing "W/E School Of Innovation" from the fundraisers, Marco's will donate 20% or your order total to the SOI PTO. If you prefer to order by phone, be sure to mention that you're ordering for a school fundraiser. The PTO will earn 15% on call-in orders. 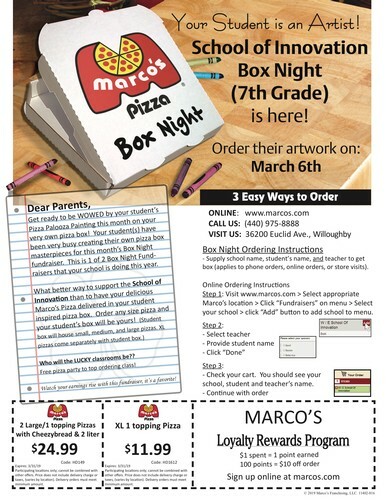 Whenever you order from Marco's, be sure to select "W/E School Of Innovation" from the fundraisers. Even on nights that aren't a specific SOI night, our school will still earn points toward bonus payments. Click below to print this month's coupons and event flyer. The Willoughby-Eastlake School of Innovation is a 501(c)(3). Your donation helps us provide low-cost and free events for students and families, while also supporting other SOI activities.